We are less than a week away from the start of another Premier League season and it can’t start soon enough. Whilst the Women’s World Cup, youth level World Cups and youth level European Championships have provided ample viewing over the summer, nothing comes close to the excitement felt at the beginning of a new league campaign. The summer transfer window has been a relatively busy one so far which suggests we are in for another compelling and competitive season. The Premier League’s expenditure (at the time of writing) stands at £303.2million, second only behind Serie A whose expenditure is £334million. The net spend, however, offers a totally different outlook with the Premier League’s net spend standing at -£155million with its nearest rival, the Bundesliga, in second place with a net spend of just -£32million. These are the type of figures that suggest an English club has a good chance of challenging for this season’s Champions League. Now, without further adieu, let’s analyse the first five teams for the coming Premier League season. Arsenal have experienced a miserable 2011 so far. The Carling Cup final defeat against Birmingham was the beginning of the slide which saw their League and Champions League hopes dashed before finishing the season, which offered so much early promise, in a disappointing 4th position. Their troubles appear to have continued during the close-season with the departures of captain Cesc Fabregas and the influential Samir Nasri edging ever closer. Factor in a tricky Champions League qualifier against Italy’s Udinese and Arsene Wenger has plenty of food for thought. Wenger’s first major foray into the transfer market was to secure the signature of Ivorian winger Gervinho in a deal worth £10.5million and, yesterday, he completed the transfer of Alex Oxlade-Chamberlain from Southampton for an initial £12.1million. Are his two new signings adequate replacements for Fabregas and Nasri? Absolutely not. They are good signings nonetheless and it will be interesting to see how often they are utilised this season. picked up another injury during a pre-season friendly which leaves Wenger to pick two from Laurent Koscielny, Johan Djourou and Sébastien Squillaci. None of those three are good enough for Arsenal. There is, of course, still time for Arsenal to beef up their defence and there have been a plethora of names linked with Gary Cahill and Phil Jagielka regularly mentioned. It’s not just the centre of Arsenal’s defence which needs strengthening. 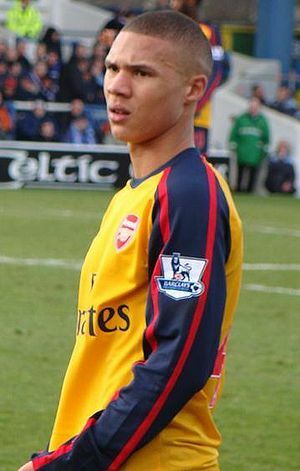 Gael Clichy’s move to Manchester City means the injury-prone Kieran Gibbs (pictured) and returning loanee Armand Traore, if he remains with the club, will be fighting to fill the void and, in my opinion, Gibbs isn’t quite ready to handle the rigours of playing week-in, week-out at the highest level and Traore simply isn’t good enough. There are a few positives for Arsenal fans this season. Jack Wilshere will continue to blossom and I expect Aaron Ramsey to make a big impact too. He’s a class individual with an eye for goal which should compliment the skills of Alex Song and Jack Wilshere perfectly. Avoiding injuries to key players such as Robin van Persie is of the utmost importance; the squad is not packed with quality and a prolonged spell on the sidelines for van Persie will be a bitter blow to their chances. Aston Villa have experienced a busy summer of comings and goings. Alex McLeish left bitter rivals Birmingham City to replace Gérard Houllier as manager and the playing staff has undergone a radical overhaul too. Villa have lost plenty of experienced players this summer with just two signings coming in. Ashley Young and Stewart Downing both left the club for big-money moves to Manchester United and Liverpool respectively, whilst the experienced quartet of Robert Pirès, Brad Friedel, Nigel Reo-Coker and John Carew all left the club on free transfers. The incoming transfers should excite the Villa faithful despite the outgoings. £9.5million man Charles N’Zogbia was instrumental in leading Wigan Athletic to safety last season and without his goals and assists, it is highly likely they would be playing Championship football this season. Shay Given is the other signing made by McLeish this season and he replaces the veteran American Brad Friedel who joined Tottenham Hotspur. Given’s acquisition is a very shrewd move. He’s consistently proved to be one of the best goalkeepers in the Premier League and, at 35 years old, offers plenty of experience to a side with a good balance of youth and experience. Given was signed for £3.3million and could prove to be one of the best signings this summer. Aston Villa do not have the biggest of squads so it is vital to keep their key men injury-free. The form of Darren Bent is paramount to any hope they have on improving on last season’s 9th place finish. His goals will be the difference between the Europa League places or a mid-table finish. 1995 Premier League champions Blackburn are in for a difficult season. New owners Venky’s have over-promised and under-delivered on numerous occasions. When they bought the club for £30m at the turn of the year, there was reason for optimism among the fans. The promise of David Beckham and Ronaldinho can be viewed as a publicity stunt by new owners unknown in Britain. Sacking Sam Allardyce and replacing him with the inexperienced Steve Kean was another disaster by Venky’s. It is arguably the second biggest mistake they have made. The biggest mistake can be seen here and it involves footballers and chicken. Feel free to recycle the Paul Gascoigne joke now. Phil Jones has been sold to Manchester United for £16.9million and David Goodwillie has been brought in from Dundee United for £2million. The futures of Christopher Samba and Nikola Kalinic are still in doubt and there is a worry of where goals will come from. Junior Hoilett and David Dunn will be expected to chip-in with goals from midfield but Goodwillie, Jason Roberts and Ruben Rochina will struggle to carry the burden of leading the line and scoring the goals required to keep Blackburn away from danger. The Blackburn defence looked shaky after Allardyce’s departure so it is important to keep hold of players like Christopher Samba. If Blackburn are to survive in the Premier League this season, Paul Robinson, Michel Salgado, Christopher Samba, Ryan Nelsen and Gael Givet need to remain fit and in top form throughout the season. Owen Coyle has done a terrific job since taking over from Gary Megson in 2010. Attractive football as well as a few shrewd signings have revitalised a group of players who seemed disillusioned under the previous management. Coyle has added Nigel Reo-Coker, Darren Pratley, Tyrone Mears and Chris Eagles to his ranks for a combined fee of £2.9million with Ali Al-Habsi, Matthew Taylor and Johan Elmander the most notable departures. It is the latter’s departure that could have the biggest impact on Bolton if a suitable replacement isn’t found. Elmander, along with Kevin Davies and Daniel Sturridge, formed a potent strikeforce with each striker possessing skills to complement the others. It is clear that Coyle is in the market for a striker and David Ngog, Jelle Vossen and Cameron Jerome have all been heavily linked. If a new striker can be signed and the influential Gary Cahill stays with the Trotters I fancy Bolton to achieve another respectable final position. Chelsea start the new season with a new manager in charge in the hope that he can deliver the Champions League for the first time in the club’s history. Andre Villas-Boas is a tactically astute young manager with a preference for the 4-3-3 formation with an attacking philosophy and his promise is clear for all to see. Ever since joining the late Sir Bobby Robson at Porto in 1994 as a 16-year-old apprentice coach, he has gone on to learn from the very best before branching out on his own to receive acclaim in his own right. Villas-Boas was sent by Robson to Lilleshall to study for his coaching badges before becoming an integral part of Robson’s youth team set-up. Villas-Boas went on to become Jose Mourinho’s opposition scout and a vital component in his backroom staff where his tactical prowess and attention to detail was key to Mourinho’s success. Fast-forward nearly two decades and Villas-Boas has won the Portuguese title and the Europa League with home-town club Porto before Chelsea met his £13million release clause to appoint him as Carlo Ancelotti’s successor. Villas-Boas’ biggest problem will be the lack of time he will be afforded by owner Roman Abramovich. The Portuguese is under no illusions and acknowledges this to be the case. Abramovich is regularly criticised (and I’m as guilty as anybody of doing this) for the way in which he disposes of managers who have failed to win the Champions League but we must accept that this is his prerogative and part of the deal when a multi-billionaire buys a football club. It is the rough with the smooth that I’ve tweeted about many times before. He’s given Chelsea fans the billions of pounds needed to transform a mid-table club into one competing for major honours year-after-year. On the flip side, he can hire and fire whoever he wants, whenever he wants. That’s the deal on the table. Villas-Boas has spent a sizeable amount so far. Belgian wonderkid Romelu Lukaku arrived from Anderlecht for £19.3million, Thibaut Courtois also arrived from Belgian side Genk for £7.9million and will spend the season on loan at Atletico Madrid as a replacement for Manchester United’s £17.6million new boy David de Gea, Lucas Piazon cost £6.6million from Sao Paulo and Oriol Romeu is a young defender who set the west-Londoners back £4.4million from Barcelona. The youth movement is something which was desperately needed at Stamford Bridge with many of the current first-team players on the wrong side of thirty. A blend of youth and experience should see Chelsea maintain a strong challenge on all fronts this season. Building the team around Fernando Torres is something which needs to happen; he’s a top class striker who will score goals. If Frank Lampard can remain fit for the majority of the season, Chelsea could well be the team to beat. All transfer fees correct according to the excellent TransferMarkt. Don’t believe the exaggerated fees you see in newspapers and on Sky Sports News!